"How to use compassion to develop happiness, self-acceptance and well-being"
I read this book last month, having requested it for a Christmas gift. It came highly recommended to me by a fellow workshop attendee (on a Heart Intelligence workshop run by Gill Wyatt). I had a conversation with this man afterwards and we talked about a stumbling block in intimate relationships - how can we truly love others if we don't love ourselves? 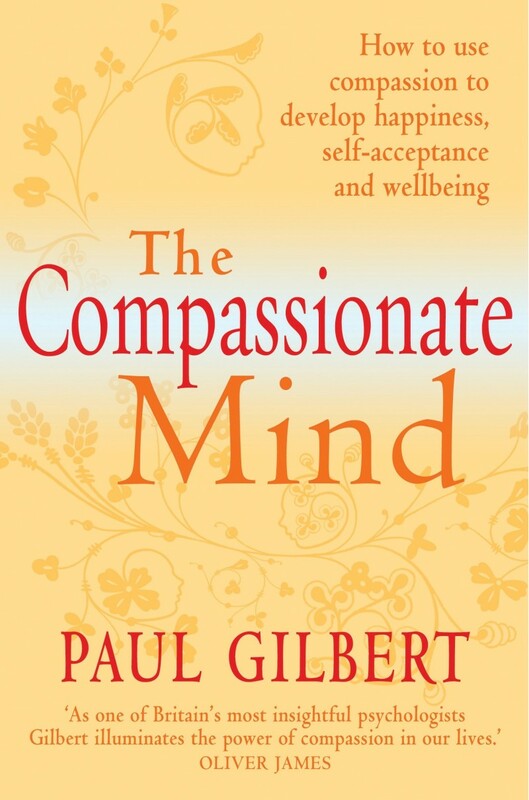 He had attended a course in Compassion Focused Therapy developed by Paul Gilbert and suggested I look into it. It has been a theme for me recently - true acceptance of all facets of myself. This is something that I endeavour to help clients move towards and it is my belief that one cannot help at the fundamental level required in therapy, if one runs away from one's own issues, paticularly if they are pertinent to current client work. So whilst I thought that I truly accept all facets of myself this was put strictly to the test at the end of last year. Some very old issues were brought abruptly to my awareness and it became apparent that there was still some work to do. What could be viewed as a horrible experience became a gift for me as it allowed me to focus on an area requiring growth and happened at a time that I was equipped to deal with it. Although I knew cognitively that I was essentially a good person worthy of love and compassion (huge growth from how I considered myself in my earlier years), there was some kind of blockage to fully integrating that belief. It is hard to articulate in a way which makes sense and, indeed, each client has their own unique way of describing the feeling of knowing something in one's head and knowing it in one's heart. Sometimes, fortunately very infrequently, my belief in myself was challenged and recognising the past experiences that caused that to be the case was not enough to shift it. Hence, psychoanalysis, in my opinion, is not enough. It is in the relationship where the client experiences compassion that fundamental shifts can occur. "In societies that encourage us to compete with each other, compassion is often seen as a weakness. Striving to get ahead, self-criticism, fear and hostility towards others seem to come more naturally to us. The Compassionate Mind explains the evolutionary and social reasons why our brains react so readily to threats - and reveals how our brains are also hardwired to respond to kindness and compassion. Research has found that developing kindness and compassion for ourselves and others builds our confidence, helps us create meaningful, caring relationships and promotes physical and mental health. Far from fostering emotional weakness, practical exercises focusing on developing compassion have been found to subdue our anger and increase our courage and resilience to depression and anxiety." Well, I would say that the book does indeed give a great explanation as to the evolutionary issue with our minds - explaning why we have emotions and describing the glitches in the construction of our emotional selves. I have believed for some time that one of the first tasks in therapy is to take away the shame associated with the unwanted way of being e.g. somebody gets angry frequently, and they feel a deep sense of shame or guilt for doing so. The problem with this is that shame or guilt makes the whole package harder to manage - take away the shame and then we can pick apart what is behind the anger. So reading the science behind our emotions can really help us to be more understanding of our reactions and responses, instead of getting bogged down with shame and guilt. Gilbert describes our three different affect regulation systems (the incentive/resource focused, the non-wanting/affiliative focused and the threat-focused) and how they compete with one another - that it is not in our physiology to be in all three modes at once. "...many negative emotions such as anxiety, anger, disgust and sadness are a normal part of our emotional repertoire...These emotions evolved to help us detect and cope with threats, but in our society, obsessed as it is with happiness, we sometimes feel that, if we experience them to any degree, there's something wrong with us...our brains did not evolve for happiness but for survival and reproduction, so we need to learn to accept, tolerate and work with difficult emotions or low moods." There are exercises designed to help promote self-compassion but I appreciate Gilbert's stance that reading a book is not enough to do this. He talks about talking therapies and the part therapists can play in helping one to develop self-compassion. "Psychotherapies should help people recognise the reality of "alternative constructions" and help them to explore the ones that are more conducive to their health and well-being. Therapists can support people as they embark on this potentially destabilizing process of literally "changing their minds"". I saw my therapist for a few sessions to deal with my recent glitch and it actually helped me to solidify my belief in what I am doing for other people through my work. There is no cure-all fix. Existence is challenging and we sometimes need help to deal with it. Beating ourselves up for not being happy all the time is a sure way of making life even harder. Sometimes we need a helping hand and I, a counsellor, sometimes need a helping hand too. I love this analogy of anger and hatred: "...both like a flame - it can cast light, give life-sustaining warmth, inspire and create passion but, unchecked and undirected, can also burn, cause intense pain and consume and turn to ash all that it touches. Anger and hatred should be seen as pointers, telling us to look back and find the source of our hurt and to be honest about our fear. In compassion-focused work, this is often the hardest thing to do, to be honest enough to work with the fear and grief that sits underneath anger." For many of us it is easier to project the hurt outwards and blame others, which serves us no favours. "You made me cross" - Gilbert illustrates another way "We can acknowledge openly that we have a brain that has systems for anger and second, notice when those sytems have been triggered. Since these feelings can sweep through us so quickly, it can be difficult to get hold of them; they can take control of us very easily. Now they were designed by evolution to do that, so this is not our fault. Given that it's untrue and unhelpful to tell ourselves that we're bad for feeling anger, when evolution has made it so easy to feel! It's also unhelpful to tell ourselves that we should not be angry when we are. Self-condemning will only make us depressed and/or more irritable". I have heard depression described as anger turned inwards. There is also a good section on anxiety and, besides trauma and loss, I would say that the majority of my clients come for help with anger or anxiety issues. I earmarked so much of this book and I was excited by so much of what is being said. I have given just a taster of what is covered. I would recommend this book to anyone, except perhaps my dear friend Robin who I think is already there. Thanks for the recommendation, I may get around to checking this out. Hope that you are well and that spring is arriving where you are. Sounds great really want to read it now. I agree with the depression comment too. You seem to give your friend Robin a lot of credit. Nice blog entry, good food for thought. You have written a great blog. It was very thoughtful blog. Thanks for sharing.